Ebola, Schmebola — You Still Have To Look Good! 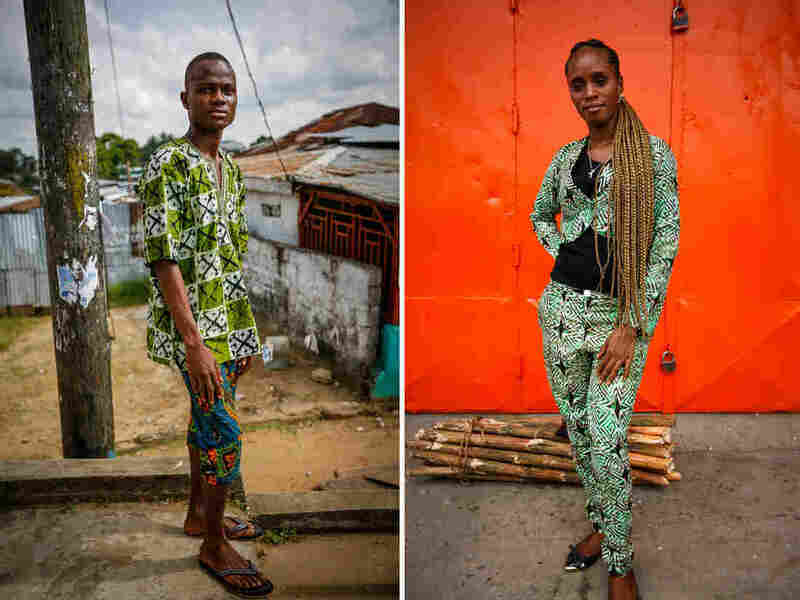 : Goats and Soda Liberians aren't letting a brutal epidemic put a crimp in their amazing sense of fashion. The streets are still full of stylish folks, because as the local saying goes, "Looking good is business." Ebola, Schmebola — You Still Have To Look Good! "Looking good is business," says Angie Kolanta, 28, holding her 2-year-old daughter, Philomena, on her hip. 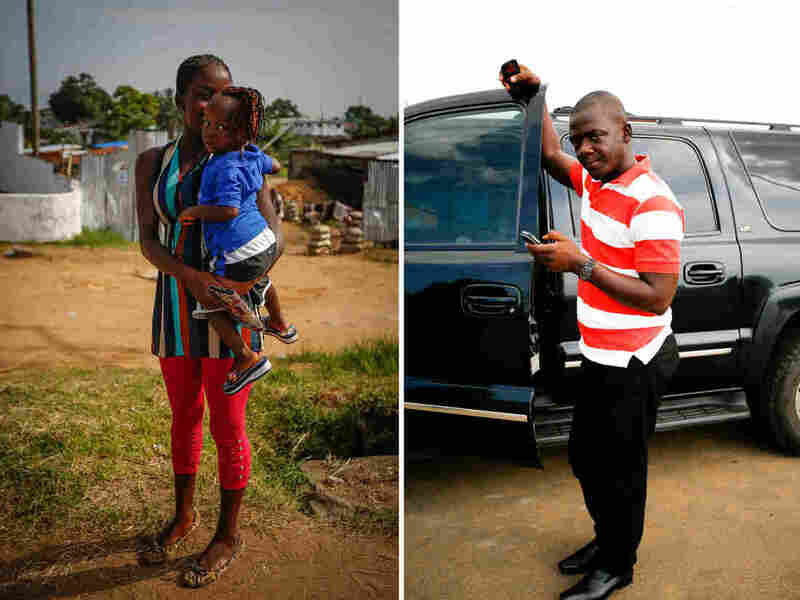 Right: "Even if poor, even if without a job, Liberians still spend money on clothes," says Muhammed Trawally, 33, who works as a driver. "They value appearance over everything." Forget Ebola. In Liberia, style is everything. "Even if poor, even if without a job, Liberians still spend money on clothes. They value appearance over everything," says Muhammed Trawally. The 33-year-old driver is wearing tightly fitted black jeans, sharp Italian-style leather shoes, a crisp orange-and-white striped polo shirt, brown-tinted aviator glasses in a gold-and-white frame and a black Casio watch. "Looking good is business," he says — a phrase that keeps popping up. "Looking good is business," says Demah Bee, an unemployed teacher. She's in a curry-colored Indian-style tunic over leggings. "Looking good is business," says Angie Kolanta, 28, holding her 2-year-old daughter, Philomena, on her hip. Philomena's hair is braided and pulled into a side ponytail. Kolanta is in bright pink sequined leggings, a matching stretch top and leopard print flats. They stopped to talk along busy Tubman Boulevard, one of the main drags in Liberia's capital, Monrovia. Vendors were walking by, hawking everything from children's clothes to smoked fish to large wall clocks. Ebola has been a blow to an already weak economy. Before the outbreak, nearly half of all Liberians were unemployed. Ebola has forced businesses to shut and put even more people out of work. But it hasn't dented the national sense of style. 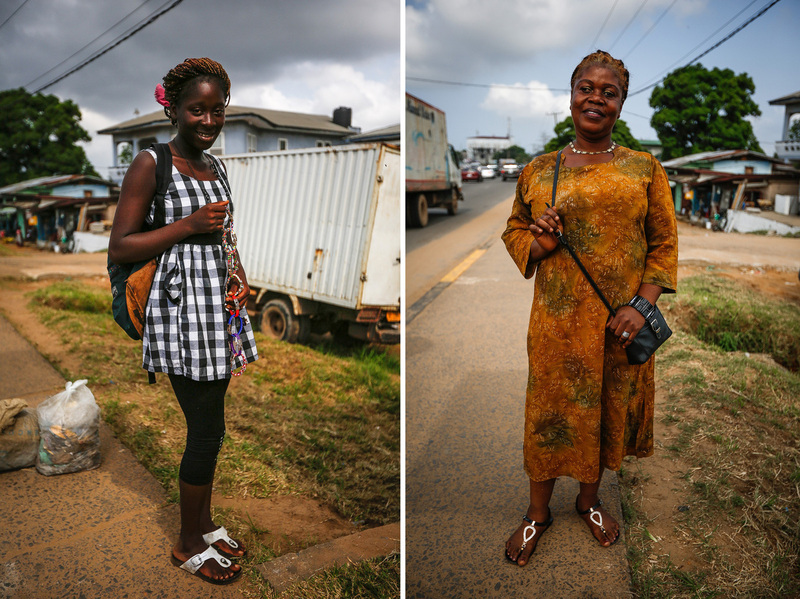 Caroline Abang, 16, (left) is selling "bangles" because schools are closed in Liberia. She hopes to become be an engineer. Right: "When you're not dressed, nobody can recognize you," says teacher Demah Bee. "They will say you're suffering too much." "We put a lot of money in our appearance," says journalist Siatta Scott Johnson, 40. "Even we don't eat because you're not looking at my full stomach. You're looking at me. We prefer to look good." She says the phrase, "Looking good is business," might have originated with a radio DJ years ago, but it's hard to know. What's certain is that it's now ingrained in the Liberian psyche. At some level, it's existential. "My appearance speaks a lot about my character and who I am and how I look. If I look a little sluggish, you would be awwww, she's not a decent woman," says Johnson, who's dressed in fashionable dark jeans, a peplum top and a sky-blue jacket. Her hair has been extended with lustrous, thick, dark braids. "But if am really well dressed, good looking, you see me as decent." Dao M. Fahnbulleh Jr. agrees. "When you look good people respect you a lot," he says. The 23-year-old student wants to become a fashion designer. He's particularly keen on African fabrics. On this day, he's wearing a green patterned batik tunic top over short pants made of a different African print. He says the deliberate mismatch is his style. "I feel proud every time I wear this dress code because people admire me. So I've just chosen to be an African stylish icon in my neighborhood." Ebola has closed schools, however, so his future currently is on hold. Dao M. Fahnbulleh, 23 (left), wants to become a fashion designer. "I feel so happy. I feel so cool. Anywhere I go, I will tell my friends, I interact with intelligent people because they look at me as intelligent person," he says. Right: "Fashion over food," says Zoe Kiada, an unemployed 25-year-old. "I feel my time is being wasted. I feel my friends and I should be out of college. But with this Ebola issue everything is shut down," he says. Already one of the world's poorest nations and still recovering from 14 years of civil conflict, Liberia was hit hard by the outbreak. But Zoe Kiadi says neither unemployment nor the presence of Ebola has dimmed her desire to look nice. "Fashion over food," says the trim, unemployed 25-year-old. She's speaking on a sidewalk along the main street to Monrovia's Freeport. "It's expensive to look good. Times are hard. To find money is very hard. But I think I always need to look good, Ebola or not." Zoe Kiadi, 25, says neither unemployment nor the presence of Ebola has dimmed her desire to look nice. What really sets her apart is her hairstyle. Kiadi's wearing coordinated green cotton African-patterned pants, vest and gold-toned flats. But what really sets her apart is her hairstyle. Twenty-seven thick blonde braids pulled together in a ponytail cascade down her back, falling just below her buttocks. 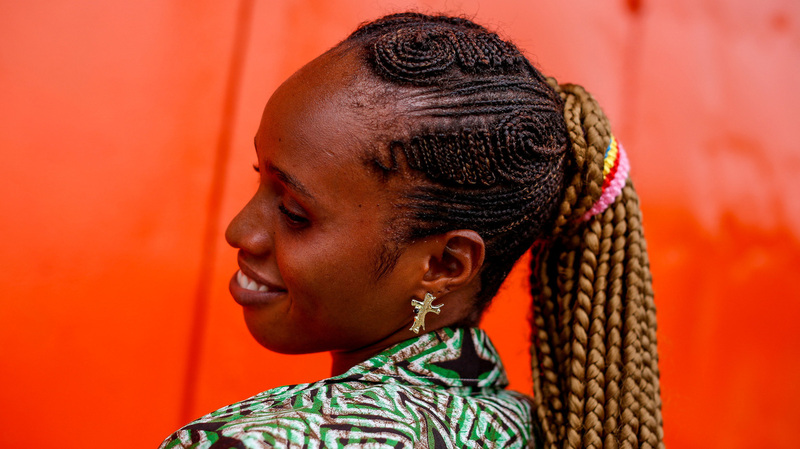 They flow from exquisitely small and intricately patterned cornrow braids swirling atop her head. She's stopped to talk in front of an auto parts store called Globe X, which sells tires, batteries and Sea Horse motor oil. Its orange exterior is getting a fresh coat of paint because there's also a municipal angle to appearances. Monrovia is a low-slung city of 1.5 million people. Ramshackle houses and shops crawl over hilly ground crammed between the Mesurado River and the Atlantic Ocean. Traders spill off sidewalks. Colorful umbrella-covered stands pour down toward the ocean. It's unclear whether war or poverty stopped construction on the many unfinished buildings around the city. Some of them are still pocked by artillery and mortar fire that devastated Monrovia during the civil war that ended in 2003. And now Ebola means that tubs filled with chlorine stand sentry at every entrance to every building so people can disinfect before entering. Nevertheless, Christmas is around the corner. There's a long-standing municipal order that Monrovians must paint the front of their homes, businesses, signs and curbs so that the city looks good in time for the holiday before a Dec. 15 deadline. So all around Monrovia people are on ladders trying to freshen up sometimes bedraggled store fronts, churches, sidewalks and homes. The ordinance aims at encouraging "citizens to give their homes a facelift, "says Isaac Jackson, Liberia's deputy minister for information. "If they don't do that, the city will fine you and people want to avoid being fined," he says. "We are decent people here. And the decency can't only be in the clothes you wear." "As long as you are not Ebola-infected, you should be able to clean your environment," he says. "Don't fall in trouble with the city police. Please do it." Because really, looking good is business.